I love a baller room makeover as much as the next person (Lisa Vanderpump’s closet? I could stare at it for HOURS), but scrapping all of your existing stuff and completely overhauling every nook and cranny of your room isn’t always realistic, especially if you don’t have a Housewives-sized budget. 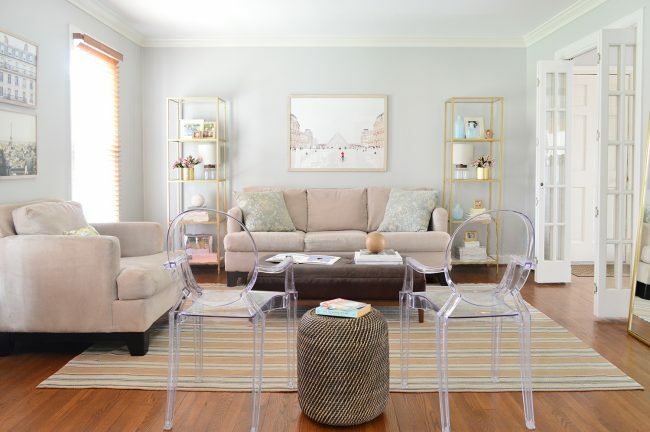 Sometimes using what you have and just getting a few new things to revive the entire room is the sweet spot (have I mentioned how much fun I had staging my friend’s house to sell a few weeks ago?!). So when my best friend asked for some help with her bare bones living room, I immediately started shouting out ideas and scribbling sketches like a lone weirdo playing solo Pictionary. You can see where we started below shortly after they moved in. 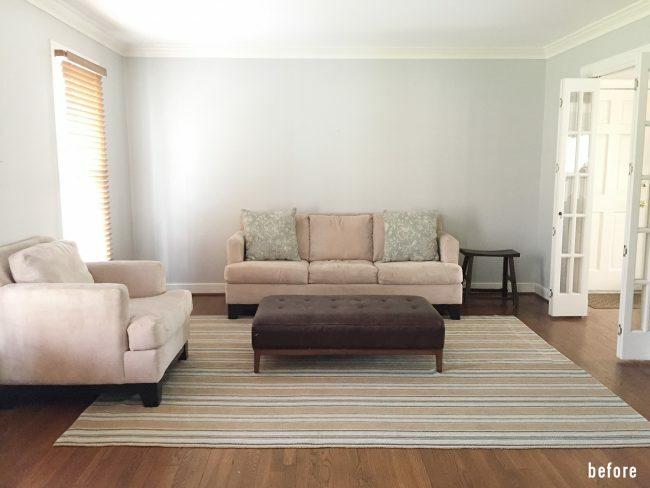 Pretty sparse with just a rug, sofa, armchair, and tufted ottoman (the wall color is Repose Gray by Sherwin Williams). It’s their “formal” living room, so the TV and big cozy sectional are elsewhere – but this room still gets lots of use (by the kiddos, for holiday entertaining, for spirited adult game nights, etc). After the move she was feeling so underwhelmed by how her existing stuff looked, she actually had convinced herself everything needed to be craigslisted so she could start over. In her mind that felt like the only option since she was so tired of the things she had, and she just couldn’t imagine them ending up in a space she truly LOVED. But her current reality = three young kids (and a cat). So after some pretty deep talks about what we coined “that sticky fingers and rogue Cheerio dust life” – all off which will be around for at least five more years – she realized she would much rather wait a few more years to update her sofa and rug with something awesome that her kids would probably be a lot nicer to when they’re a little older. Enter Captain Optimism stage right (that’s me, btw – my other aliases include Sergeant Enthusiasm and Petty Officer Peppy). I was all “Woah, woah, woah – this stuff is neutral enough that it can work with anything! Let’s not throw the baby out with the bathwater.” Then we took a long conversational detour to discuss how weird that whole baby/bathwater expression is, but eventually circled back to the task at hand: me successfully convincing her to Tim Gunn it in there (aka: make it work). By just moving in some stuff she already owned and purchasing a couple of accent chairs, a pair of super inexpensive bookshelves, and three pieces of art that she adores – we breathed a ton of new life into her old stuff (btw, her neutral sofa and armchair are more tan and less pink in person than they look in these pics). Plus everything we added will not only work with this existing stuff, but should she replace their seating or their rug down the line, well, these new pieces will play nicely with whatever else she chooses. 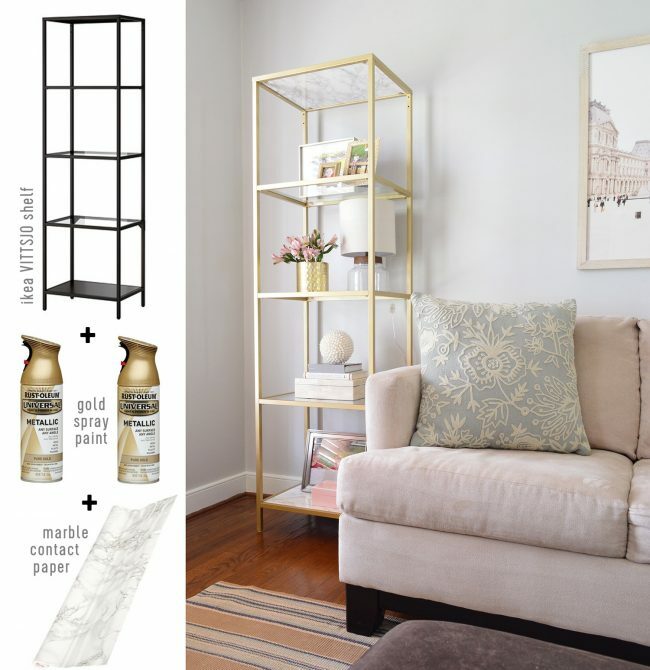 The main “projects” in the room were the gold display shelves flanking the couch. 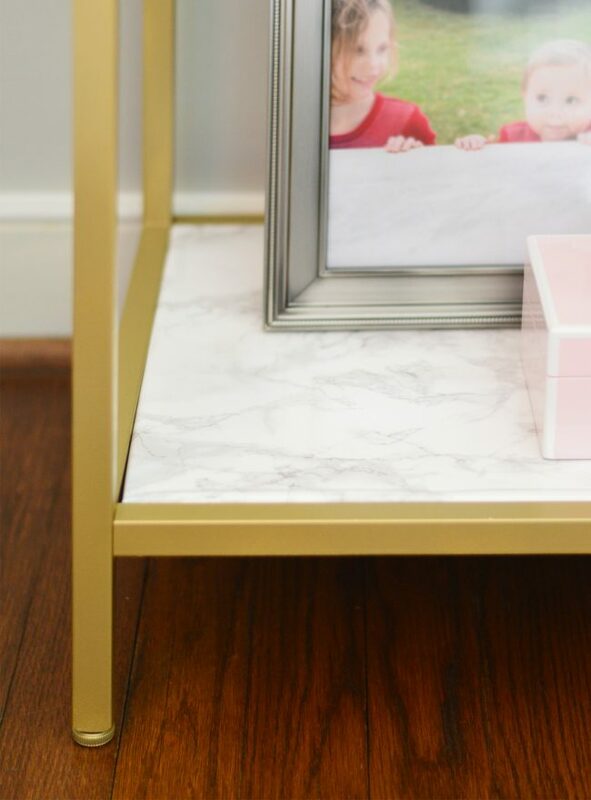 They were a DIY effort that we tackled together and they only required two $50 Ikea shelves, this gold spray paint (the primer is built-in so it’s just one step, and it’s the best gold color I’ve found), and this marble contact paper. As for the how-to details, after we assembled the frames of each bookshelf (leaving the actual shelves aside), we spray painted both of them with a few thin and even coats of gold spray paint and allowed them to cure outside for two days so they wouldn’t stink up the house or get dinged up when we brought them inside. Here’s a detail of the bottom shelf (you can see the top shelf in the pic above). All of the middle shelves are glass, but the top and bottom were solid metal – so when we dressed them up with the marbleized contact paper, we only covered the visible side of each one. It was sorta like wrapping a present where you just fold an inch or so of excess around the backside of each one. The contact paper didn’t affect the fit, so they still slid right into place. It was an idea that she found on Pinterest a while back and had always wanted to try – and it could not have been easier. The other high-impact addition was the art. 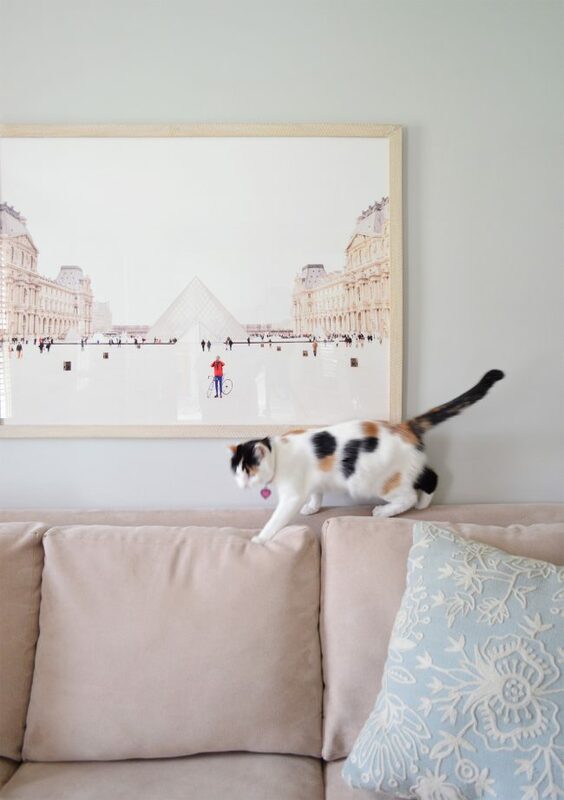 The large piece on the back wall is this photograph from Minted (in the 40 x 30″ size with the whitewashed herringbone frame – my favorite of theirs). 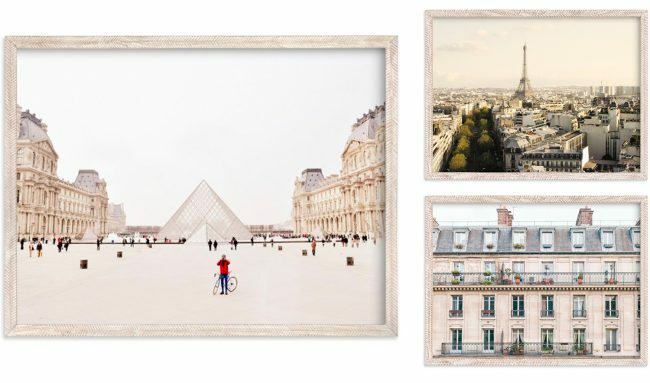 The other two that were added to the mix are Paris View and Day in Paris (both 24 x 18″ with the same whitewashed frame). Also: this is Kitty Purry (named after Katie Perry’s cat by their oldest child). I like her because she matches the art. Also because she’s a sweet kitty who only occasionally makes my eyes itch thanks to my stellar cat-intolerant genetics. Let’s bring it back around to the before shot one more time, just to show one last “zone” that we added to fill out the room. The only other purchases for the room were the two $65 ghost chairs that we added on the exposed edge of the rug, which help the seating area feel more complete and extra functional (now we can squeeze in two more butts on game night). They actually already owned two of these acrylic chairs in their dining room, so I just dragged them in here to test them out. We liked that the clear acrylic lets your eye travel through them (if they were larger or more solid it might feel like a jarring “wall” of chairs in your face). Once they were sold on the look, they just ordered two more so they weren’t short on dining room chairs. And that side table between them? That’s a basket they already had turned upside down. How’s that for using what you have? We also brought in (and anchored!) a leaning mirror they already owned for one last hit of gold in the room. She got it a few years ago at West Elm, but it’s back in stock in brass (it tends to go in and out, so here’s a similar one on Wayfair). And for the accessories on the shelves, we just used stuff she had around the house – some magazines stacked horizontally, framed photos, boxes, vases, and these perfectly-sized lamps that put out a nice glow at night. Most of their books live on built-ins in the other room, so these shelves got to be more decorative and light. 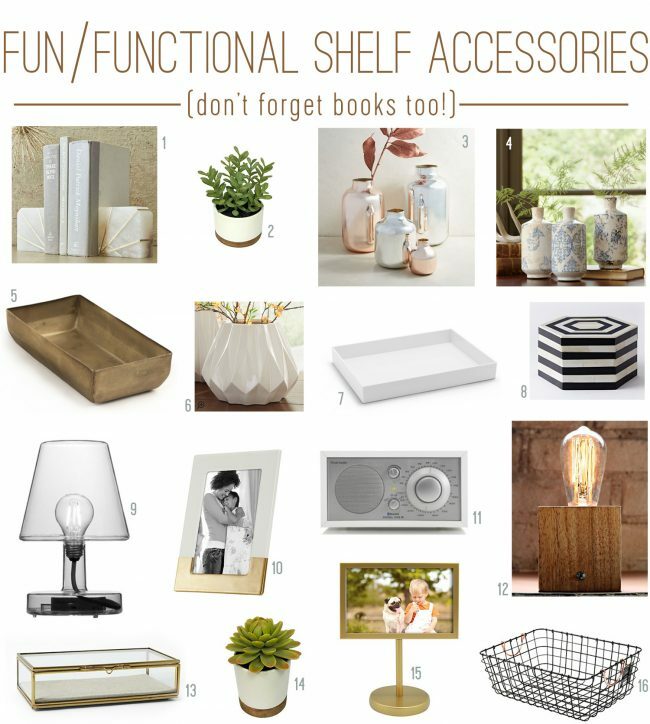 For anyone else who is faced with bare shelves, or crazy cluttered ones, my best shelf-styling tip would be that a few larger scale items are better than a bunch of little busy or piddly looking ones, and I love decorative boxes, stacks of mags and books, framed photos, and a few vases – perhaps with some cheap grocery store flowers if you’re feeling fancy (we paid $4 total for the two bunches that you see in the after pics). This probably isn’t the last time you’ll see this house (you’ve actually already seen their son’s room, and we’re slowly working with them on a bunch more). 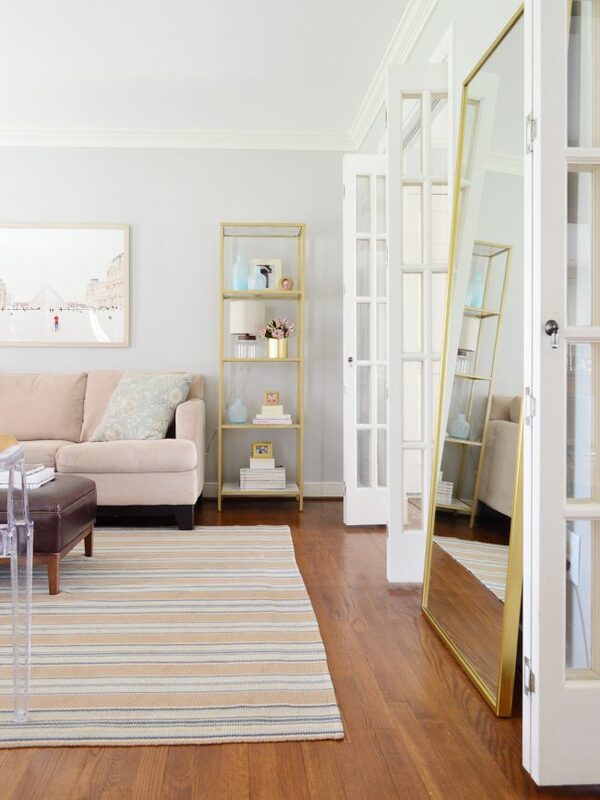 But I just couldn’t wait to share this tale of turning a room’s frown upside down with just a few new items. Total time spent: around 5 hours including planning, measuring, assembling, spray painting, marble-papering, ordering things online, and hanging prints. Taking a detail shot for the post just as Kitty Purry saunters by: priceless.